What is ventilator-associated pneumonia (VAP)? A “pneumonia” is an infection of the lungs. A “ventilator” is a machine that helps a patient breathe by giving oxygen through a tube. The tube can be placed in a patient’s mouth, nose, or through a hole in the front of the neck. The tube is connected to a ventilator. A “ventilator-associated pneumonia” or “VAP” is a lung infection or pneumonia that develops in a person who is on a ventilator. A patient may need a ventilator when he or she is critically ill or during or after surgery. Ventilators can be life-saving, but they can also increase a patient’s chance of getting pneumonia by making it easier for germs to get in to the patient’s lungs. 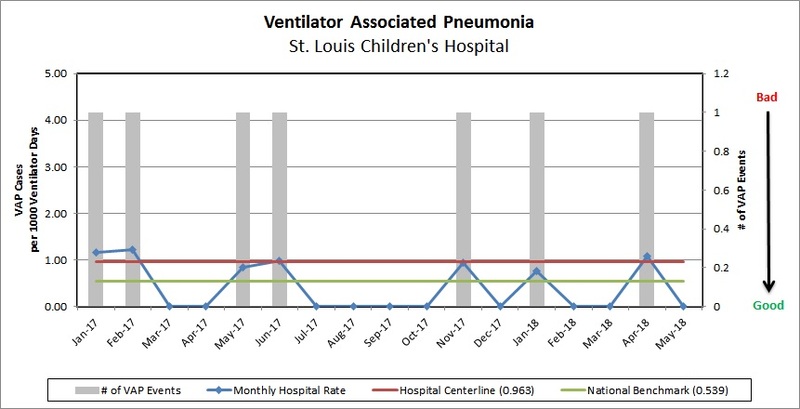 Why do we measure the number of ventilator-associated pneumonia infections? Research has shown that proper preventive care while the patient is on a ventilator can reduce this risk. The number of ventilator-associated pneumonia infections per 1,000 ventilator days. Each day that the patient is on a ventilator counts as one ventilator day. Weaning patients from the ventilator machine as soon as possible. Following strict hand washing/alcohol-based foam use before and after contact with the patient or the ventilator. Swabbing and cleaning each patient’s mouth every four hours. Elevating the head of the bed by 30 degrees. Draining ventilator tubes of secretions before repositioning the patient. Draining condensate secretions away from the patient. Requiring care providers to wear a gown and gloves to prevent contamination of respiratory therapy equipment and ventilator circuits. Cleaning and replacing equipment between uses on different patients. What can families do to help prevent VAP? Ask your doctors and nurses to explain why your child needs the ventilator machine and how long it will be needed. Make sure that all doctors and nurses clean their hands with soap and water or alcohol-based foam before and after caring for your child. Make sure you and all family and friends who visit your child wash their hands with soap and water or alcohol based foam before touching your child. For more information about how to prevent VAP, visit the Centers of Disease Control at http://www.cdc.gov/HAI/vap/vap_faqs.html.